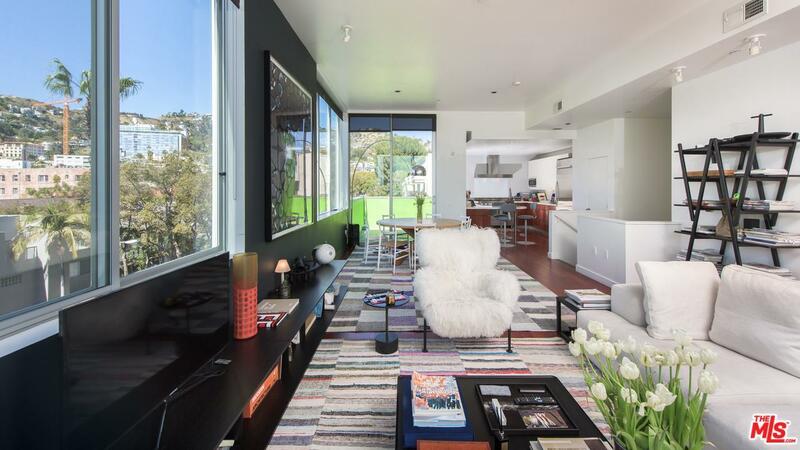 Stunning townhouse-style Penthouse with spectacular views and no common walls, located in prime West Hollywood. This immaculate 3-bedroom, 2.5 bathroom residence is designed like a stand-alone home with no common walls and a dramatic modern design. Interiors feature an inviting open plan with high ceilings and incredible natural light, a large, private balcony and walls of glass highlighting panoramic views of the Hollywood Hills and Sunset Strip. The chef's kitchen also includes unobstructed views, as well stainless appliances and an eat-in bar. Retreat downstairs to the luxe master suite and find a walk-in closet, and spa-like bathroom with dual sinks, soaking tub, stall shower, and rich cabinetry. Additional highlights include two guest bedrooms, powder, laundry, dual-zone heating and air, and 2 secured parking spaces. Enjoy the best of urban living, a stone's throw from West Hollywood dining, nightlife, and shopping. This will not last, priced for immediate sale!